On my way home from work today I was called by my friend Aage LA1ENA over the LA5GR 2m repeater. He was stuck with a flat car battery after accidentally leaving the headlights on while he was operating portable from a local hill called Vestre Vealøs (SOTA ref: LA/TM-013). There is no cell phone coverage on the parking spot but fortunately he was carrying his Yaesu VX-6 and was able to call for assistance on 2m. 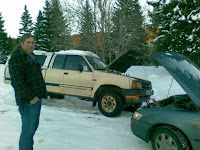 I was only 10 minutes away so I was able to help him to jump start the car. Nils Cato LA4AFA heard our qso and offered to lend us his jump leads but I am carrying my own leads so we didn't need them.The temperature was about -10°C at the place. Good job you were able to hear his call for help, Mads. It reminds me of some of my first days in ham radio back in the '70s when I lived at home and had to work mobile because my father wouldn't allow me an antenna. I was using an ex-commercial VHF radio-telephone modified for 2m FM which ran off an inverter. It could exhaust a battery pretty quickly, and I only realised what was happening when the inverter while started to go lower in frequency. Fortunately I had parked facing down a slight incline and was able to bump-start the car without assistance. Impressive Toyota knowledge! My previous car was a Corolla too and we also have an Avensis 2006 Station wagon. I don't care about cars as long as they run and that's why I drive Toyota. They always work! such situations rescued as CB-radio !